The much-anticipated lumber super cycle is still in the cards, the question is only that of timing. Global softwood lumber markets are gradually returning to health. While the rapid rise in lumber prices in the first four months of the year brought a flurry of euphoric mainstream media references to an emerging “super cycle,” the reality is that the expected peak of a super cycle is still two or three years away. Lumber demand is expected to grow over the next five years, driven by U.S. housing starts and strong export markets, where supplies will gradually (albeit unevenly) follow. But the question is: will there be enough logging and sawmilling capacity to meet the potential demand? Starting in the early 2000s, it was evident that the mountain pine beetle would dramatically kill and permanently reduce the B.C. Interior’s lodgepole pine timber supply. By the end of this decade, the B.C. Interior will have lost about 20 per cent of its total timber supply with an equivalent reduction in processing facilities. Since the mid-2000s, a series of sweeping Quebec government initiatives have reduced the timber harvest for sustainability, environmental and policy reasons. As of April 1, 2013, the Quebec government put into place its New Regime that has reduced most producers’ historical timber allocations on public land by up to 25 per cent. The net result is a 35 per cent permanent timber supply reduction since the peaks of 2004. In Ontario, the government has also been tweaking its timber harvest policies, although the most serious issue has been the bankruptcy of its sawmill industry: 2012’s lumber production was only at 25 per cent of its peak levels achieved in 2004. Canada’s softwood timber harvest and lumber production is forecast to plateau about mid-decade and will likely yield no net growth after this point. Starting in 2006, the Russian government initiated a log export schedule that resulted in a 25 per cent log export tax on Russian logs by mid 2008. Consequently, Russian log exports collapsed from 52 million cubic metres in 2007 to 22 million cubic metres in 2009 and have continued to drift lower each year since. As China has been the largest buyer of Russian logs, market chaos has since developed where new supply in both logs and lumber to China has strained global supply. A new (lower) Russian log export tax (13 per cent on European-bound spruce and 15 per cent on red pine; other species remain at 25 per cent) coupled with export quotas is now in effect with more chaos in play. Timber in the U.S., New Zealand, Australia and other regions has been sold by corporate forest products companies to investor groups (Timber Investment Management Organizations, REITS and non-integrated private owners). When timber supply and demand are more balanced, incremental timber can become less attractive to mills as it tends to be sold at the marginal price and this can set the forward prices for all timber at higher levels. This can often put the brake on lumber companies’ strategies to expand production. 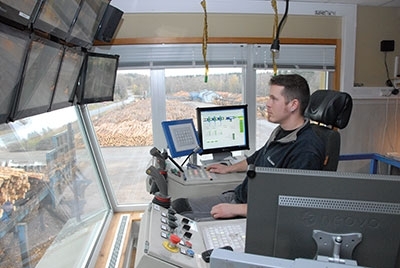 U.S. West coast mills are under continuing log supply stress – between U.S. and Chinese demand for logs and the private timberland owners’ strategies, sawmills remain reluctant to add capacity due to high priced logs. Taken together these factors are creating a much more restrictive log supply at both the regional and global level. Against these supply constraints, U.S. demand started to rebound strongly in early 2012 with prospects that housing starts will double from 2011 to 2016/17 (780,000 units to over 1.5 million units). At the same time, China has been a new market force as it has searched for new sources of logs and lumber to replace Russian logs as the economy continues to expand. Japan consumption has also increased recently, partly due to a mini-boom in home construction prior to the consumption tax increases scheduled for April 2014. Throw in the rising imports in a variety of other traditional as well as emerging markets coupled with an eventual recovery in Europe, and the prospects for lumber producers and exporters looks spectacular. A general upward trend in lumber prices could last up to five years as the U.S. housing market and global economy recover, and as a constrained North American forest industry tries to rebuild its supply chain and expand to meet what is expected to be steadily growing demand. As prices rise and timber supplies tighten, new wood sources (such as exports from Europe to the U.S.) and wood and non-wood substitutes are forecast to emerge to fill any short gaps in U.S. lumber demand. If the tension in timber supply and lumber production remains tight, then lumber prices will hit all-time highs as early as 2015. Over the next two or three years, supply chain bottlenecks and market demand wild cards will ensure dramatic market volatility, such the upswing (and subsequent tumble) in lumber prices observed in the first half of 2013. In addition to log shortages that will occur as contractors ramp up production, shortages of trained labour as well as available railcars and trucks will also have an impact. On the demand side, more traditional factors influencing prices such as domestic weather patterns and inventory levels at foreign ports will also impact prices. Short-term shortages and/or supply gluts will certainly result in a gut-twisting roller-coaster ride for lumber prices. Volatility will be a major concern for businesses throughout the supply chain. Both North American lumber distributors and importers of European lumber will need to avoid getting stuck with high-priced inventory during cycles of declining prices. In fact, this uncertainty could slow Europe’s return to North American markets. Such volatility will make doing business more challenging; however, the overall outlook is definitely positive. An outlook for multiple years of growth for North America, steady consumption in Japan, a strong likelihood of continued growth in China, and an eventual recovery in Europe indicates that markets will generally be on an upward trajectory for several years. Alice Palmer is a consultant and Russell Taylor, president, with International WOOD MARKETS Group, Vancouver, BC. This article was written exclusively for Canadian Forest Industries, and was summarized from WOOD Markets Monthly International Report (May 2013) and the WOOD MARKETS May 2013 Global Softwood Log & Lumber Conference. International WOOD MARKETS Group Inc. is Canada’s largest wood products consulting firm. Its consulting team has provided industry and market expertise in the solid wood products field to its clients since 1993. The company provides market research, new business development and business plan/strategy as well as other consultative services to wood product companies in North America and around the world. The firm also publishes a number of strategic industry multi-client reports including its landmark WOOD Markets Monthly International Report (since 1996) and monthly China Bulletin. Further information is available on www.woodmarkets.com.